A new cover image for newLISP on Rockets! 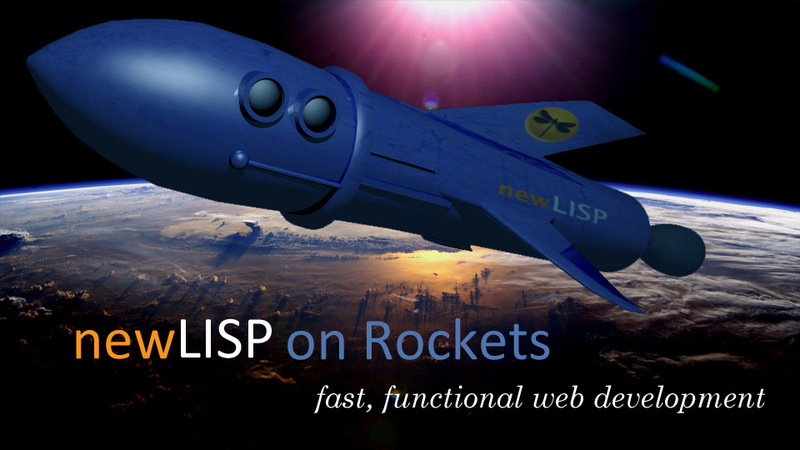 Posted by: Jeremy Reimer on Tue Jul 16 21:03:24 2013.
newLISP on Rockets is my rapid web application development framework, which powers this blog and other sites. The code is available for free under the GPL at the newLISP on Rockets Blog. I decided that I wanted to have a little nicer-looking logo and front page graphic for the framework than the little cartoon rocket I started with. So I whipped up a new model in Blender using simple cylinders and basic commands like Extrude and Size. Blender is really easy once you get the hang of all the shortcut keys, and those keys make things MUCH faster than using primarily mouse-driven 3D software. I UV-unwrapped the model in Blender, got a free stock metal texture from cgtextures.com, and put the UV-wrapped texture together in Photoshop (I got the logos from newlisp.org.) The background picture is from a NASA weather observation satellite. Welcome to the new JeremyReimer.com! Posted by: Jeremy Reimer on Wed Feb 20 16:36:17 2013. The primary reason for this change was to get all my websites on a single platform and to "eat my own dogfood" in terms of the newLISP on Rockets framework. Also, the Rockets framework is based on Twitter’s Bootstrap and thus has a nice responsive design that works much better on mobile devices. Go ahead, try it on your phone! Not everything is converted yet (the user profile page, for example) and there may be some bugs over the next few days as I work all the kinks out. Please let me know if you have any issues. Posted by: Jeremy Reimer on Tue Jan 15 23:27:18 2013. I’m trying to expand my efforts in book marketing, and much of that involves fumbling around trying things at random, hoping that something works out. This brings up the number of blogs I have to three: my personal blog, the newLISP on Rockets blog, and now my GoodReads blog. Once JetCondo.com gets going that will increase to four. It seems a bit weird, like casting a wide net in hopes that someone reads at least ONE of my blogs, but in truth I never felt that comfortable talking about everything in one place. I have a lot of things on the go, especially now, but they aren’t all connected. People interested in my science fiction probably don’t care too much to learn about newLISP, for example. So after the end of this week, I might actually stop blogging every day on my personal blog, and alternate between the the three instead. We are live on a new server! Posted by: Jeremy Reimer on Wed Dec 5 17:07:53 2012. A bunch of stuff from the old jeremyreimer.com still hasn’t been transferred over yet, but the main blog is (hopefully) working! This new server is actually an Amazon EC2 instance I’m trying out. Yes, jeremyreimer.com is going into the cloud. Will we ever escape it? Who knows? Further exciting updates as they come in! Posted by: Jeremy Reimer on Fri Aug 17 20:03:38 2012. Here’s my pet peeve of the day: Blogs that say things like: "Find out the answer after the fold" or "More after the jump". YOU ARE A WEB PAGE. THERE IS NO FOLD. THERE IS NO JUMP. If I want to continue reading, I will continue reading. Maybe I’ll have to scroll down. If I care enough, I will. I’ve never once gone to a blog and thought to myself: "Well, this wasn’t interesting enough to keep reading, but I have to find out what’s after that jump!" What the hell is a jump, anyway? Oh, you put a stupid ad to break up your content? Is that what you meant? Wow, I’ve almost lost interest in your page now. Oh look, there’s the "Close" button on the tab. I wonder what happens if I press that? © 2019 Jeremy Reimer. Rendered in 11 milliseconds. Used 128 KB of memory, 105 KB for Lisp Cells. Rockets version: 0.46.